With Microsoft joining the ranks of hosted software companies chasing the ultimate PIM/CRM/ERP solution for SMB market under the new leadership of Ray Ozzie, the OfficeLive platform seems to be getting some serious attention within Microsoft. 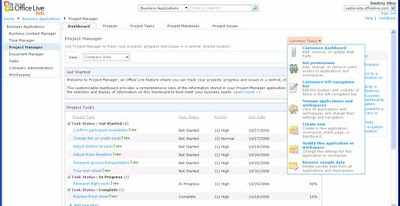 While not yet viable (in my opinion) as a replacement for MS exchange environment or to compete with other hosted specialized offerings, the foundation seems to be there with Outlook integration, extensive use of AJAX and what seems to be a fairly good and flexible platform. It usually takes Microsoft 3 tries to get things right. This particular application might follow a different path as it competes with other MS offerings and we’re yet to see how Microsoft is going to reconcile its offerings. For now, it makes a fairly good choice for new businesses looking for an inexpensive solution for web site and email hosting with a few extra features that has good potential to grow with the company.